What a perfect morning! Light wind, bright sun, the birds are singing & the whole world is in bloom! I feel like I can’t or shouldn’t waste a minute of it. A perfect morning in the Garden! 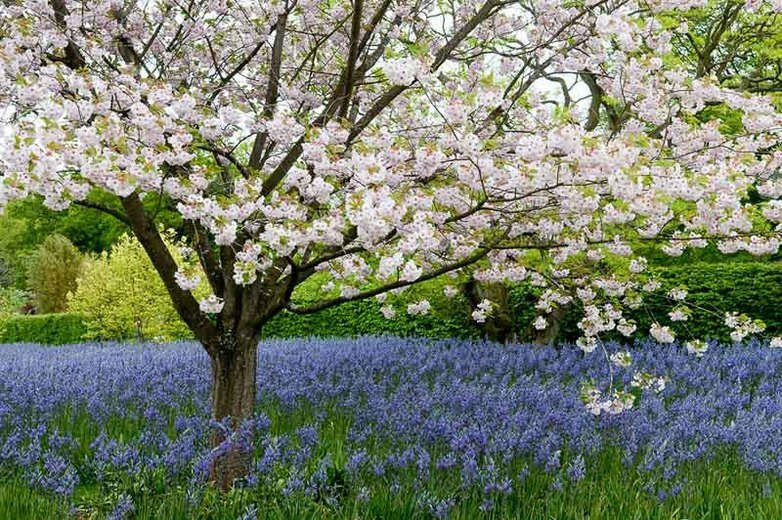 I have found a wonderful new treatment that helps to accelerate the transition from Winter blue to Spring happiness – It’s called ‘Nurseryfix’ (patent pending)…. Of course this is a joke – but not really… Getting out on a day like today and going to a local Garden Center or Botanic Garden and smelling the roses makes you feel fine! The sun is shining, the birds are singing, the hummingbirds are swarming around the feeders and the whole world is in bloom! 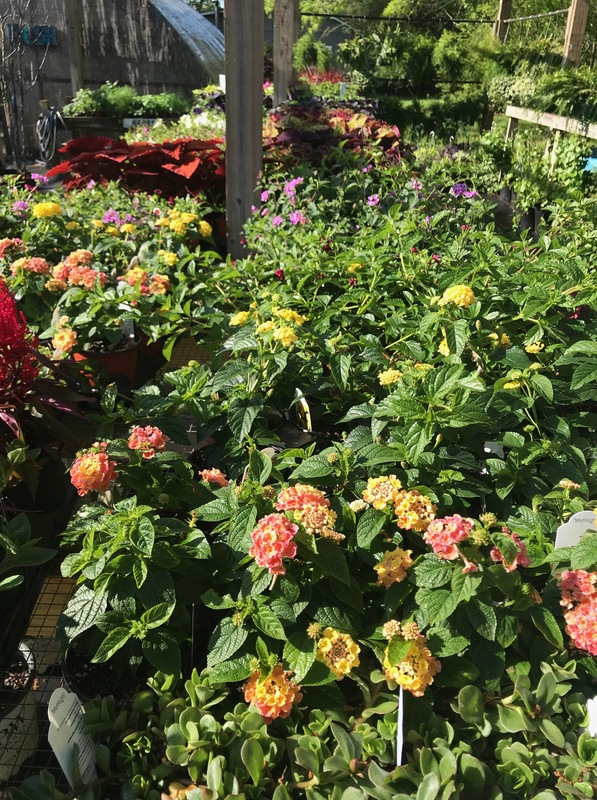 Blooming Annuals, Perennials, Aquatic Plants, Hanging Baskets and so much more await you at Carters Nursery! I’ve been out since before the sunrise and only came back in to write this blog… I hope you enjoyed it and I hope you enjoy this beautiful weekend in YOUR garden 🙂 That’s exactly what I’m going to do! It’s time to feed the fish 🙂 Your welcome to come by and join me. Have a great weekend! What a BEAUTIFUL day! AND – What a GREAT show today with Dan & Sea Bass – The 180 Crew! The weather has turned for the better and it finally looks and feels like Spring! This weekend is lining up to be the nicest of the year so far! My question to all of YOU is – What are YOUR plans? What are YOU gonna get out there and do this beautiful Spring weekend? It’s going to be a BEAUTIFUL weekend! 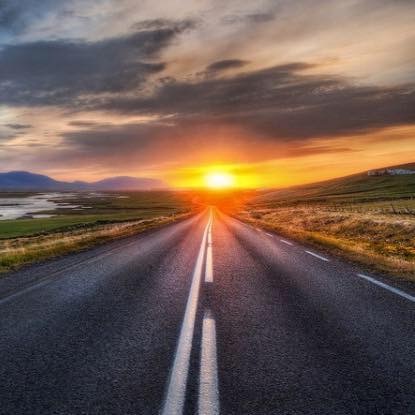 Are you gonna get out on the open road? What can I do about leaf spots on my shrubs and roses? This is a very common problem this time of year. Clean up and trim heavily infected stems and foliage. Rake up around & under the shrubs and roses and dispose of or burn – Don’t compost. Spray/treat with fungicide, Neem Oil, Lime Sulfur, etc… Water earlier in the day if needed and under water roses (keep foliage dry as possible). How do I prep the soil for my tomatoes? I always move/rotate the planting area yearly. Amend the soil – till in some lime VERY important! ), compost (mushroom compost &/or worm castings & composted manure (chicken or black cow). Don’t get it too hot with too much Nitrogen! So not too much manure, and I like to use 3-4 types of organic composts – it makes ALL the difference. 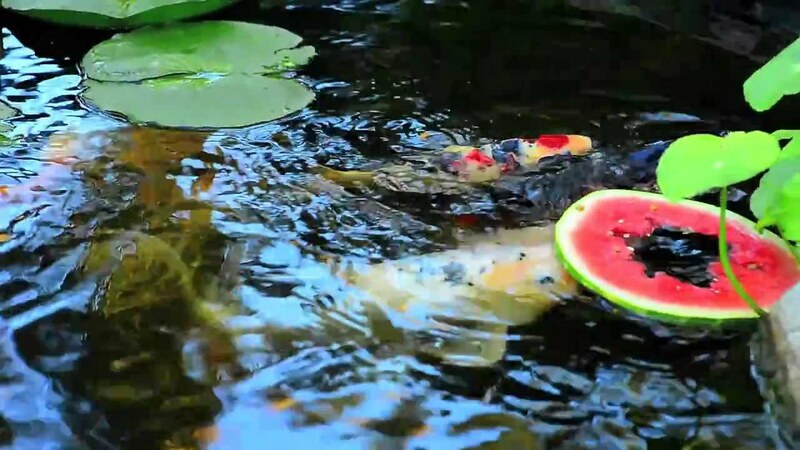 When is the Summer Pond Tour? Saturday, June 23rd. 9am. – 4pm. Then we open back up for the annual after party, the “Moonlight Luau”! Live music, Kalua Pork, Tiki Torches and Waterfalls Galore! Do I have Tomatoes available at the Nursery? Yes we do! We have tomatoes and several other vegetables as well as Annual and Perennial Flower, Hanging Baskets, Shrubs, Fruit Trees, Aquatic Plants and more. 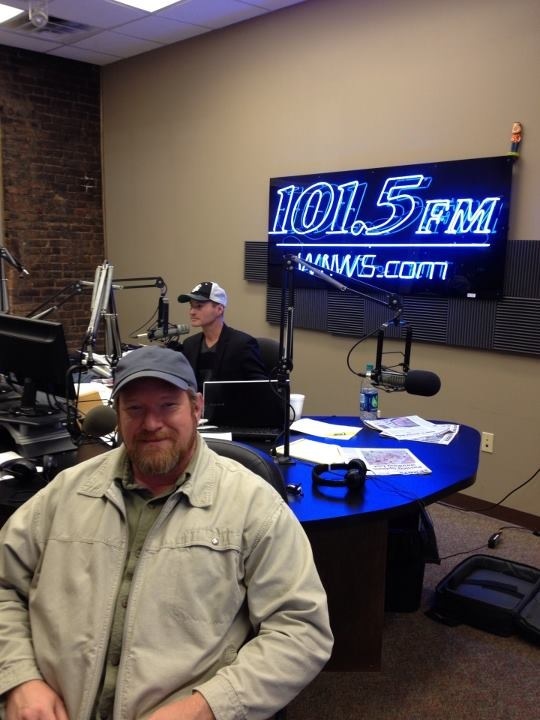 I’m on with the 180 Crew – Dan Reaves & Sea Bass- every Friday from 10-11am Call in with ALL your gardening and Outdoor Lifestyle questions at 731-423-8101. Thanks for the calls and questions! I’ll see you on the air next Friday at 9:30am-11am.! 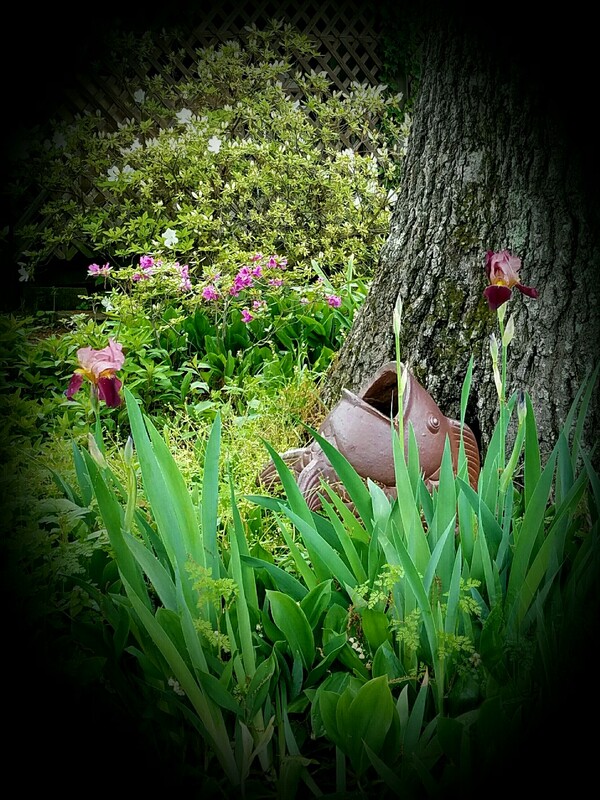 The Iris is our State Flower in Tennessee. The Iris takes its name from the Greek word for rainbow, which is also the name for the Greek goddess of the rainbow, Iris – pretty cool! 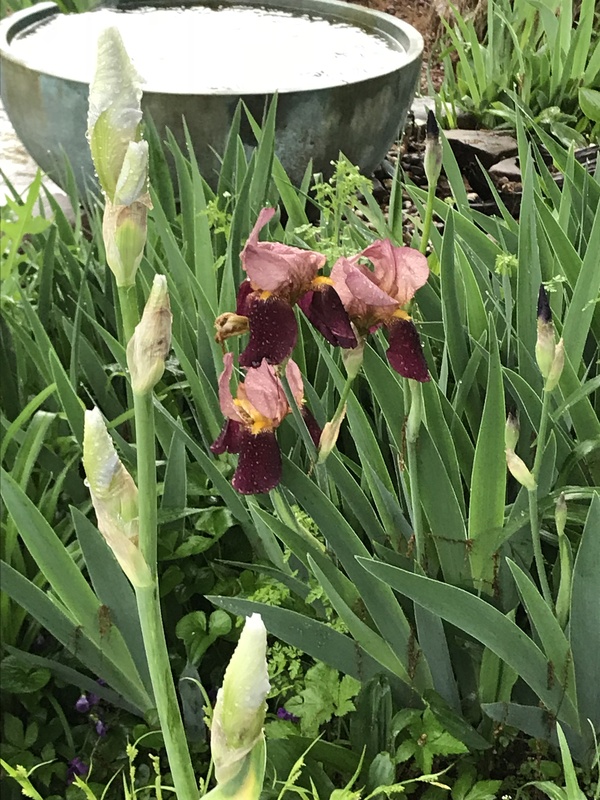 The Iris was designated the Tennessee state cultivated flower by the Legislature in 1933. My Great Grandmother remembered when that occurred – She was born in the late 1800’s. Do you have any old ‘heirloom plants’ that bring back memories? Some folks call them ‘Memory Plants’… I have many around the nursery that do just that. I actually remember the day that my grandparents started developing that flower garden. It’s still there all these years later 🙂 To me, thats the ultimate ‘Throwback Thursday’! Today we are looking at a Koi with a solid white base that has black and blue edging, over laid with red and black patterns. WOW! LOTS of color! They are called Goshiki Koi, whick translates as ‘Five Colors’. Goshiki may be found in butterfly koi as well as standard fin type. They are also referred to as ‘Peacock Koi’. 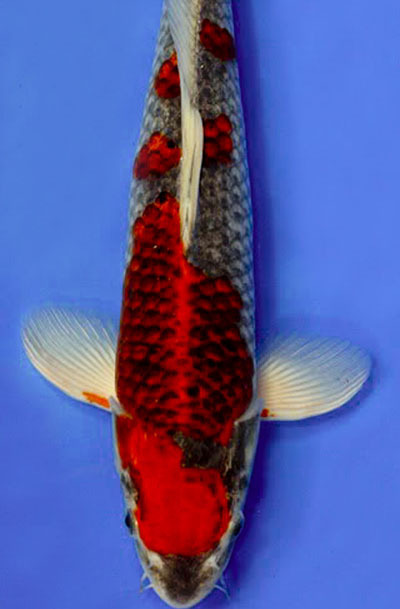 Show quality Goshiki Koi should have a nice Kohaku Pattern of Hi (red) as well as blue &/or gray scales with a consistent reticulation on all of its scales (net pattern). Our Annual “Evening By the Pond” is coming up – I always host the 1st. one of the season here at the Nursery. When? – Thursday, May 17th. at 6:30pm. 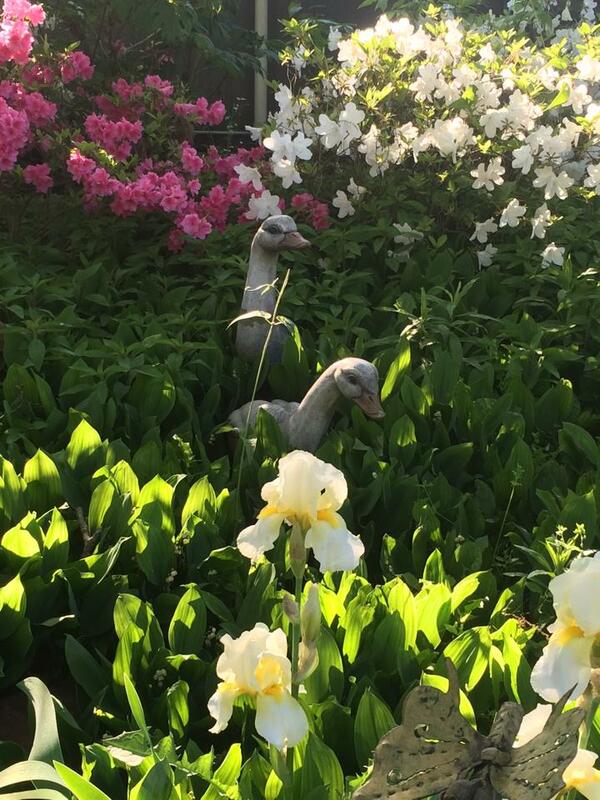 Come out and enjoy a laid back evening exploring the beautiful gardens & relaxing by the ponds. We always enjoy some GREAT food, visit and meet with friends & we always have an educational program on Water Gardens, Aquatic Plants, Fish OR some cool subject for all that come. These little get together’s are held during the warm season and in different peoples backyard retreats. If you would like to come & enjoy the evening please let us know and you will be put on the e-mail invitation list. Call Jo at 731-424-2206. 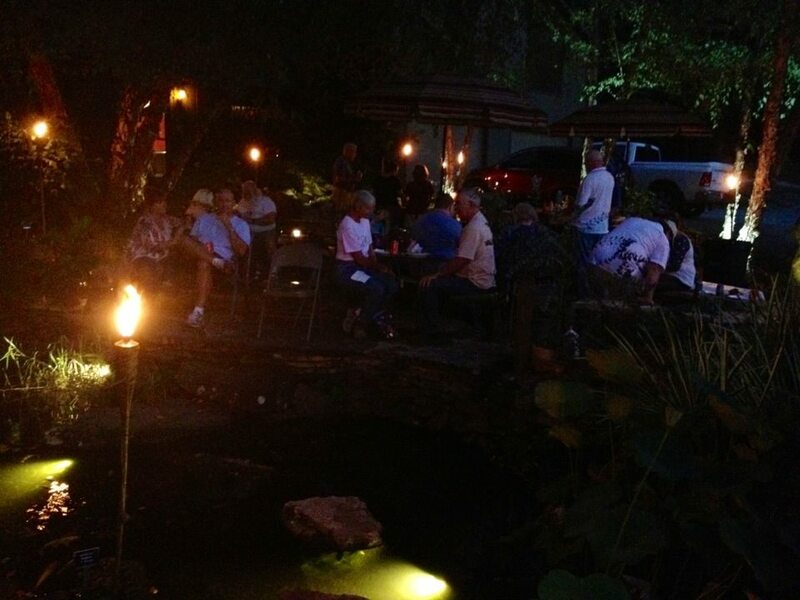 We always have FUN at our ‘Evenings by the Pond’ events! Come see what Outdoor living is all about. 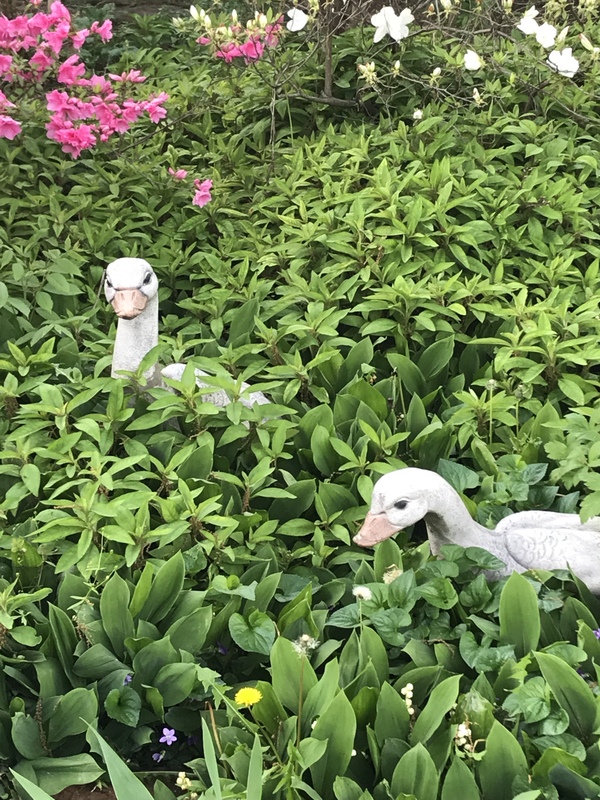 –The first “Evening by the Pond” of the season will be hosted by Mark Carter & family at the Nursery Home on Thursday May 17th at 6:30pm. The 2nd. upcoming event is our Annual Butterfly Program! June 2nd. (Saturday) 9am. –11am. – Butterfly Garden Workshop & Release: We will have great information on creating your own butterfly garden, special butterfly plants & more! 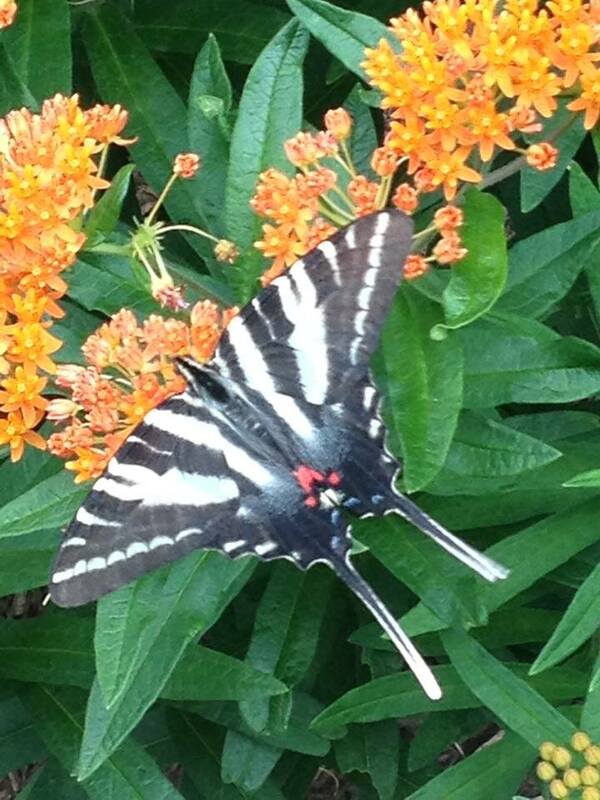 The morning will begin with a Butterfly Garden Plant Class at 9am. 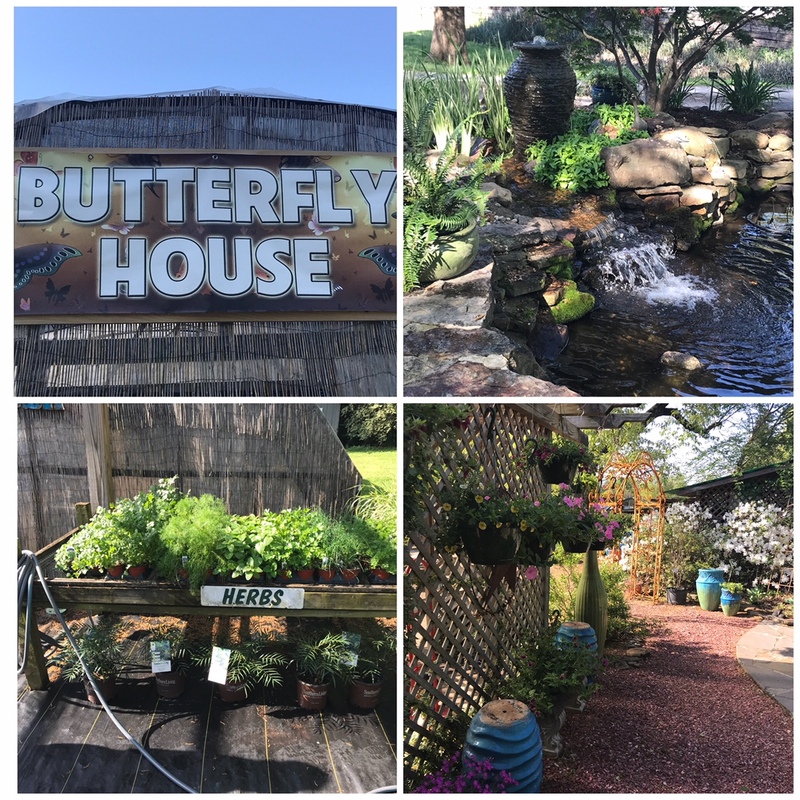 We have Mrs. Betty Stephens coming out to teach you all about ‘HOW TO’ attract these beautiful butterflies to your garden with proper Plant selection. Mrs. Betty is a Master Gardener, a Butterfly Enthusiast & a wonderful resource to teach on the subject of Butterflies! She will start us off with a great Garden Workshop about Host Plants, nectar plants and how they work with the Butterflies in your Garden. At 10am. we will all move inside the Butterfly House for a LIVE Butterfly Release! It’s so Beautiful folks! We will release a few groups of different species of Butterflies and we will have individual Butterflies that Kids and Adults will release. We will also have a Chrysalis Board with several different types of Butterflies! You can actually see their Life-cycle in action. GET HERE EARLY to get a good place in the Butterfly House! AND, if you want to release a Butterfly or want your child to release a Butterfly, call asap to get your name on the list ($5 each) – NUMBERS ARE LIMITED! Kids LOVE this event! Call ASAP to sign up for a Butterfly of your OWN to release at the class on June 2nd. Our annual Butterfly Release is a don’t miss event! 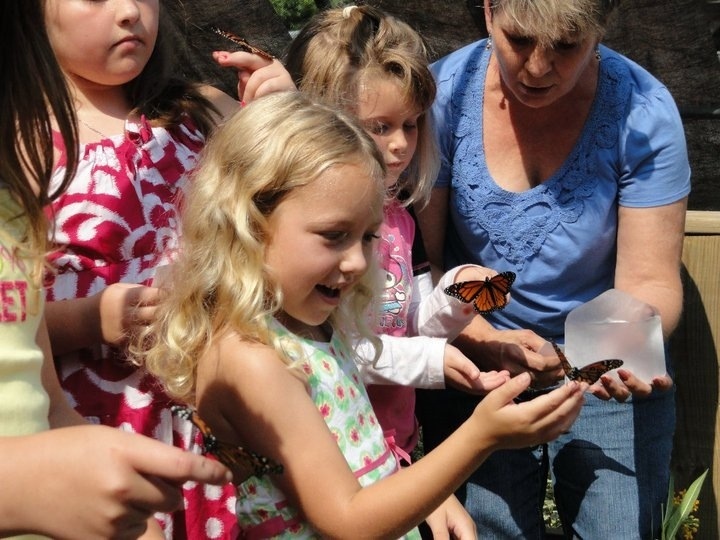 Call to register and order a butterfly for you or your child/grandchild to release – June 2nd. 2018. AND bring a CAMERA! Don’t miss this one! Call for more info and to order a Butterfly to Personally Release (Only $5)! #731-424-2206 – ask for Jo. Thanks and I look forward to seeing you at these exciting events!